For years, Kathleen Gould, PhD, and her colleagues have drawn models of the contractile ring — the molecular apparatus that physically divides cells — and its parts. They used genetic studies to probe how the protein parts fit together, but their models involved some educated guesses. 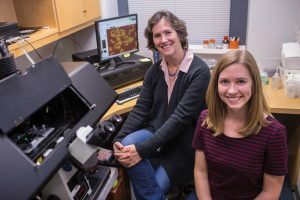 Kathleen Gould, PhD, left, Chloe Snider and colleagues are studying how the contractile ring forms and functions in cell division. Photo by Anne Rayner. “We drew things certain ways, but we didn’t really know,” said Gould, Louise B. McGavock Professor of Cell and Developmental Biology. Using super-resolution microscopy tools available in the Nikon Center of Excellence at Vanderbilt University School of Medicine, the investigators have determined the molecular architecture of the contractile ring in the fission yeast. Their findings, published in the journal eLife, provide a framework for understanding how the contractile ring forms and functions in cell division — a process that is essential for life. Cancer is a consequence of uncontrolled cell division because of genetic mutations or other defects that dysregulate the cell cycle machinery. The contractile ring apparatus is tightly linked to the cell membrane and uses myosin motor proteins to constrict an F-actin ring (actin is a filament protein that also forms the cell’s cytoskelton). By studying yeast, a simplified system, Gould’s team and others have been able to define a complete “parts list” of the protein components in the contractile ring. These proteins are similar to those found in the contractile rings of mammalian cells. But functional studies of how the ring components split a cell in two have been limited by an incomplete understanding of the ring’s organization and how it forms, Gould said. “We want to understand how all these parts interact with one another and how they are regulated,” she said. The paper is the first to result from data acquired using imaging resources at Vanderbilt, said Matthew Tyska, PhD, scientific director of the Cell Imaging Shared Resource (CISR), which includes the Nikon Center of Excellence. Ian Macara, PhD, met his $1,000 fundraising goal as a Pink Tie Guy for the Susan G. Komen Central Tennessee organization. 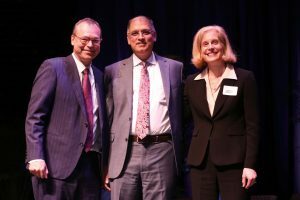 Vanderbilt University Medical Center held its first Directorship Celebration in January to honor and support leaders in clinical care, research, education and administration. “These directorships are critical to our entire institution, as they make it possible for us to fulfill our role as a national leader in healthcare,” said Jeff Balser, MD, PhD, President and CEO of VUMC and Dean of Vanderbilt University School of Medicine. Some of the directorships are funded by the Medical Center, while others were created and endowed thanks to the generous donations of individuals and their families who support the VUMC mission. Two of the holders of the eight new endowed directorships are with Vanderbilt-Ingram Cancer Center (VICC). From left, Jeff Balser, MD, PhD, Madan Jagasia, MBBS, MMHC, MS, and Jennifer Pietenpol, PhD. Madan Jagasia, MBBS, MMHC, MS, is the holder of the Beverly and George Rawlings Directorship. He is executive medical director of the cancer patient care center at VICC, section chief of Hematology and Stem Cell Transplant and director of the Outpatient Transplant Program. He is the founding investigator of a consortium to study graft-versus-host disease, a complication of stem cell transplants. Under his co-leadership of the Translational Research and Interventional Oncology Research Program, VICC was selected last year as one of the nation’s first cancer centers to administer a groundbreaking immunotherapy to patients. Jagasia leads VICC’s “first in human” team, which is investigating a new cellular therapy for cases of the blood cancer myeloma that are resistant to standard treatment. Beverly and George Rawlings established Jagasia’s directorship to support his work and discoveries, which are advancing understanding and treatment of myeloma. Jennifer Pietenpol, PhD, is the holder of the Brock Family Directorship in Career Development. She is Executive Vice President of Research for VUMC, director of VICC and Benjamin F. Byrd Jr. Professor of Oncology. Pietenpol is a prominent investigator whose genomic research is leading to better understanding of triple-negative breast cancer and new treatment options for patients. As VICC director since 2008, she led two successful renewals of VICC’s designation by the National Cancer Institute as a Comprehensive Care Center. One of 47 in the country, VICC is the only Comprehensive Care Center in Tennessee that treats both adults and children. Mary and John Brock III established the directorship with their children Rebecca Brock-Dixon, John Brock IV and Major Brock, to support efforts by Pietenpol to develop and mentor leaders who will advance innovation and discovery to improve cancer care. Acupuncture is one of the many treatments available to cancer patients at the Osher Center for Integrative Medicine at Vanderbilt. The goal of acupuncture is to encourage the body to improve its functioning and help ease the side effects of cancer treatment. It improves quality of life and well-being by easing pain, nausea and fatigue, while boosting the body’s immune strength. It does not replace regular cancer treatment, nor does it treat cancer. Chongbin Zhu, LAC, PhD, is an associate professor of Medicine and a practitioner of traditional acupuncture and Chinese medicine. He is also a neuroscientist and pharmacologist, serving as a research faculty member at Vanderbilt University School of Medicine. Zhu graduated with a medical degree from Anhui College of Traditional Chinese Medicine in China. He received his PhD in acupuncture and neuroscience at Fudan University Medical Center. He received post-doctoral training in molecular neuroscience at Vanderbilt Center for Molecular Neuroscience. Chongbin has published more than 30 articles researching acupuncture and the mechanisms of pain, depression and anxiety. He has practiced acupuncture and traditional Chinese medicine since 1989. The first LaryHacks event, what will be an annual competition to design innovative devices, apps or methods to assist laryngectomy patients who have had their voice boxes removed, was held in April at Vanderbilt University. Vanderbilt is one of the leading centers for head and neck cancer care in the country and a Center of Excellence in the Southeast with a patient referral base across seven states. 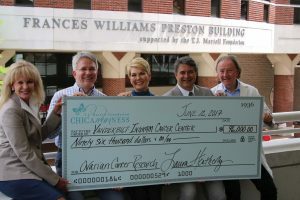 This year marks the 25th anniversary of the partnership between Vanderbilt-Ingram Cancer Center (VICC) and the T.J. Martell Foundation, one of its leading philanthropic supporters. The foundation — the music industry’s largest foundation funding innovation in cancer research — has raised over $18 million for VICC since making its first major gift in 1993. It has supported a range of research initiatives, focused largely on lung, breast, ovarian and prostate cancers, as well as hematological malignancies. This research has in turn leveraged millions more in funding from the National Institutes of Health and other large-scale funders. My Cancer Genome, an online precision cancer medicine knowledge resource that provides up-to-date information about cancer mutations and related therapies, has also received crucial support from the foundation. The T.J. Martell Foundation was created in 1975 by music executive Tony Martell following the death of his son T.J. from leukemia. Its partnership with Vanderbilt-Ingram started when music industry executive Frances Williams Preston helped secure funding for what would become the research building bearing her name. Harold (Hal) Moses, MD, director emeritus of the cancer center, headed the Preston laboratory from its inception until his retirement last year. Although both Tony Martell and Preston have since passed away, the foundation’s support continues to be instrumental to the cancer center’s research. “This marriage of music and medicine continues to be deeply rewarding, and it’s one of the reasons that the Martell name is prominently displayed on the front of our cancer center,” said Jennifer A. Pietenpol, PhD, Director of VICC and Executive Vice President for Research at Vanderbilt University Medical Center. Vanderbilt-Ingram Cancer Center (VICC) now has a new software system designed for the future. VICC, along with all of Vanderbilt University Medical Center’s hospitals and clinics, has transitioned to eStar, an Epic-based clinical software platform. The rollout presented unique challenges for VICC and took months of preparation, said Mia Levy, MD, PhD, Ingram Assistant Professor of Cancer Research and director of Cancer Health Informatics and Strategy at VICC. The system now has 700 clinical research protocols built into it. The effort was led by the eStar Advisory Group, consisting of Levy, Lauren Hackett, Anna Rodriguez, Lise Ridings, Michael Neuss, MD, Madan Jagasia, MBBS, Debra Friedman, MD, Ingrid Meszoely, MD, Leigh Jones and Julia Cartwright.